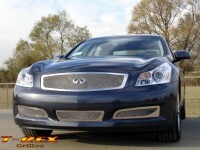 54809: 07-09 Infiniti G35 Sedan Upper Class Stainless Steel Replacement Mesh Grille. Chrome plated wire mesh and highly polished mirror finish durable stainless steel CNC machined frame gives you the highest quality available in custom grilles for your G35. Comes with all necessary hardware and installation instructions. Installation time is approximately one hour. Replaces the factory OE grille. Matching 3pc bumper mesh grilles are available below. (Bumper grilles do not fit Sport models or models with road sensing cruise control.) Backed by manufacturers five year warranty. Made in USA. Tell your friends about the Upper Class Stainless Steel Replacement Mesh Grille. Share this product on Facebook, Twitter, MySpace or send an email to a friend!